T. J. O'Malley (1915-2009), who launched astronaut John Glenn (b. 1921) into orbit, is photographed on the left, and Dr. Calvin D. Fowler, who launched Scott Carpenter (1925-2013), Wally Schirra (1923-2007), and Gordon Cooper (1927-2004), is seen on the right. 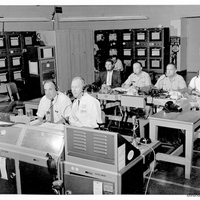 O'Malley, Dr. Fowler, and other unidentified members of the launch crew are photographed here at the Cape Canaveral Air Force Station Launch Complex 14 Launchpad Blockhouse. 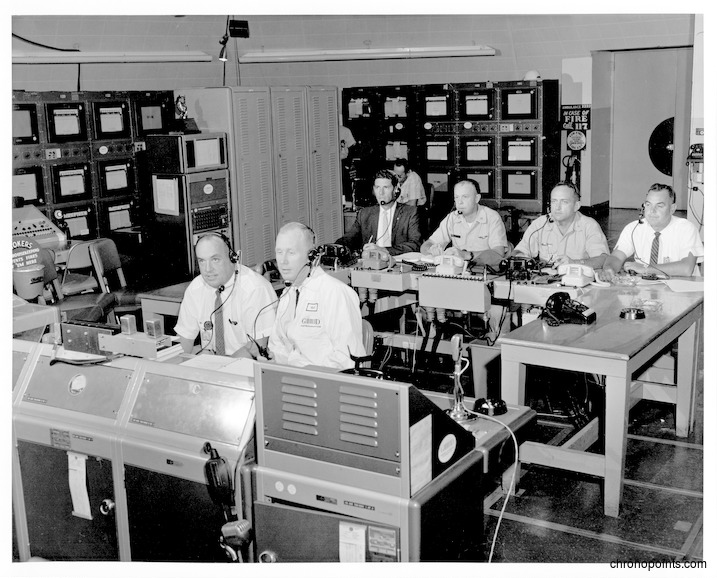 “Launch Crew in the Cape Canaveral Air Force Station Launch Complex 14 Launchpad Blockhouse.” RICHES of Central Florida accessed April 18, 2019, https://richesmi.cah.ucf.edu/omeka/items/show/4999.